Traveling is tiring. Come stay with us. Located at Cadillac Cafe. A nice bunk, a fan and a shower. Clean and Comfortable. Close to all Beaches and Dive Shops, overnight laundry services, Cafe, Calls to USA are free, dirt bike rentals, centrally located, 5 minute walk to Gaisano Grand Mall, baggage storage, safes for storing small valuables, pharmacy next door, security guards, no brownouts, lounge with TV, internet cafe, located on the main road in the middle of everything! There's not a better location! 15 minutes from Cebu International Airport. Checkout time Noon. Located at Cadillac Cafe, Mactan Island, Basak, Cebu Philippines. Just p350 for a bunk and a shower. We welcome backpackers. 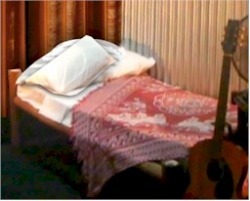 We have private rooms, with fan and bathroom, for just 650pesos nightly, double occupancy. 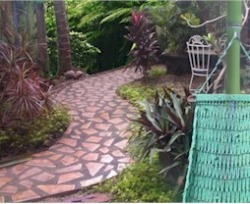 We also have private rooms with aircon, private bath, and double occupancy for P1050 per night. Or fill out the contact form at the bottom of this page to reserve your room over the internet. Delicious, hot, home cooked breakfast, available on premises. Try our terrific pancakes, or our English breakfast. Folks love our fish sandwich, and our genuine Mexican Style Hot Tamales with a spicy bowl of chili. We look forward to your visit. Have your breakfast in our garden. Spend a restful afternoon snoozing in a hammock underneath a palm tree. Taxis are abundant outside our compound, as well as tricycles. We are in the very heart of Mactan. A convenience store is located just across the street with razors, soap, shampoo and whatever you may need. We can even rent you a bicycle if you want to take a ride. If it's just one day or a week... or more, Banana Moon Hostel, Mactan, Cebu, will make you feel right at home. Come, relax and recharge at our place. Just 15 minutes from Cebu International Airport. and comfortable bunk, electric fan, and a refreshing shower. Best value on Mactan Island, Lapu Lapu, Philippines. We rent scooters, motorbikes, dirt bikes. Backpackers and Overnighters are Welcome. cheap place to stay in Mactan Island Hostel, Hostel Philippines. Contact Banana Moon Hostel & Hotel, Now!